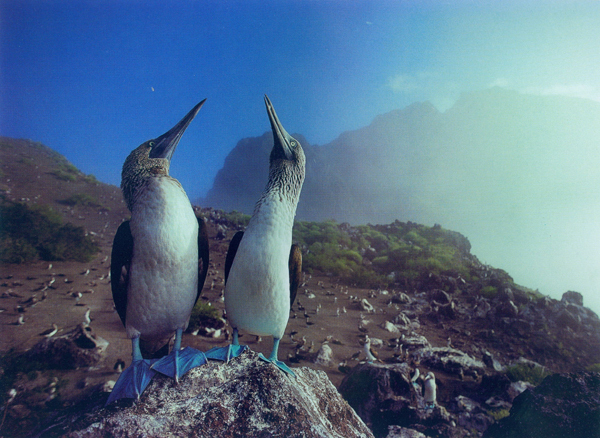 Like many people the world over I’ve wanted to visit the Galapagos Islands ever since I knew they existed. Whether this desire is because of the influence of the islands on Darwin and his theory of evolution, the numerous documentaries about them, the fact that Kurt Vonnegut based a novel there, their distance from everything and their consequential inaccessibility, the amazing birds and lizards and tortoises, or some combination of all of the above doesn’t matter so much as the fact that the Galapagos serves as somewhat of a universal dream for naturalists everywhere. 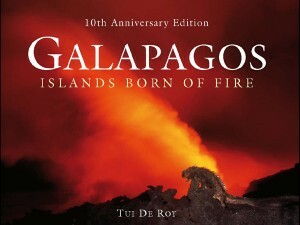 That Tui De Roy, author of Galapagos: Islands of Fire, which has been remade in a 10th anniversary edition that will be available in January, was fortunate enough to grow up and spend most of her life living in the Galapagos is simply not fair. Fortunately for the rest of us, she shares her unique perspective on her home through exquisite images and clear prose that really convey to the reader a sense of what the Galapagos Islands are about and how much they mean to De Roy. When one thinks of the Galapagos one generally thinks of finches, lizards, and tortoises. This book has all three in spades and much more than that. Whether one is interested in marine life, geology, ornithology, herpetology, botany, environmentalism, or any combination of topics this book has something that will draw one’s eye. Several times I could hardly believe my eyes when looking at one of the amazing images shared in the book. De Roy is expert at framing shots so an interesting animal sits in the foreground, initially drawing the eye, while the background of amazing scenery seems to extend forever (like with the Blue-footed Boobies above). If I didn’t know better I would think she was shooting the creatures in front of a green screen and adding the background in later. She also effectively uses low light situations, shadows, and strong contrast to create images that seem more likely to have come from a painter’s palette than from a photographer’s viewfinder. Though De Roy is self-deprecating in her author’s note, saying that all she does “is capture the light of the moment, on a small scrap of celluloid made sensitive by modern technology,” her feelings for the Galapagos, a place that she clearly loves deeply, come through on those scraps of celluloid and make each image more than a mere record of a moment. But more than images are included in this fine volume. De Roy explains her upbringing in the Galapagos and briefly covers the islands’ history (geological, biological and human) as well. The book is well arranged into , each of which cover a different aspect of the islands, and the text serves to explain both what is in the images and, more importantly, the context in which the images were taken. It is one thing, after all, to see a picture of a lizard on a rock in water, and another thing entirely to know what it is doing there and the amazing adaptations that the species has made in order to survive. De Roy explains without becoming pedantic and though the images are undoubtedly the biggest reason to buy the book the text alone would be worth the cover price. In addition to exulting in the amazing natural splendor of the Galapagos the final chapters of the book look at a successful conservation initiative, The Isabela Project, which removed goats from a large portion of Isabela Island, helping to save the native ecosystem (especially the tortoises), and other conservation issues that the islands face. That the Galapagos Islands face many threats is beyond doubt, but there are also many people and organizations championing the protection and conservation of the unique natural treasure that they are. 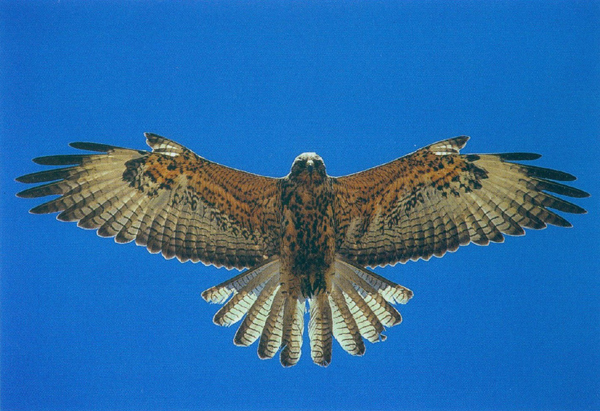 De Roy encourages her readers to contact and support any of a variety of conservation organizations that she conveniently lists. It is unfortunate that a place like the Galapagos would be under threat, but so long as there are people like Tui De Roy helping spread the word one feels like they have a fighting chance. Of course, not everyone who wants to will be able to visit the Galapagos Islands in their lifetime. It is therefore a very good thing that De Roy has created this book because it is the next best thing to being on the islands born of fire. I highly recommend this book to anyone interested at all in the natural world.